The Duke Blue Devils started out their NCAA Tournament a little slow, but the amazing Duke Freshmen, specifically Zion Williamson, R.J. Barrett and Cam Reddish, continued to be aggressive in the second half to make up for a frustrating first half. “We started out just taking jump shots and not working the ball,” Blue Devil’s coach Mike Krzyzewski said. “Once you get behind, there’s the confidence level of the other team and the pressure of the game. I thought our defense picked up after about 10 minutes. In the second half, we played just beautiful basketball for those 12 minutes.” They ultimately disposed of North Dakota State by 23 points. With some time before their next game on Sunday, Duke fans can breathe a little more after the teams been off a week. 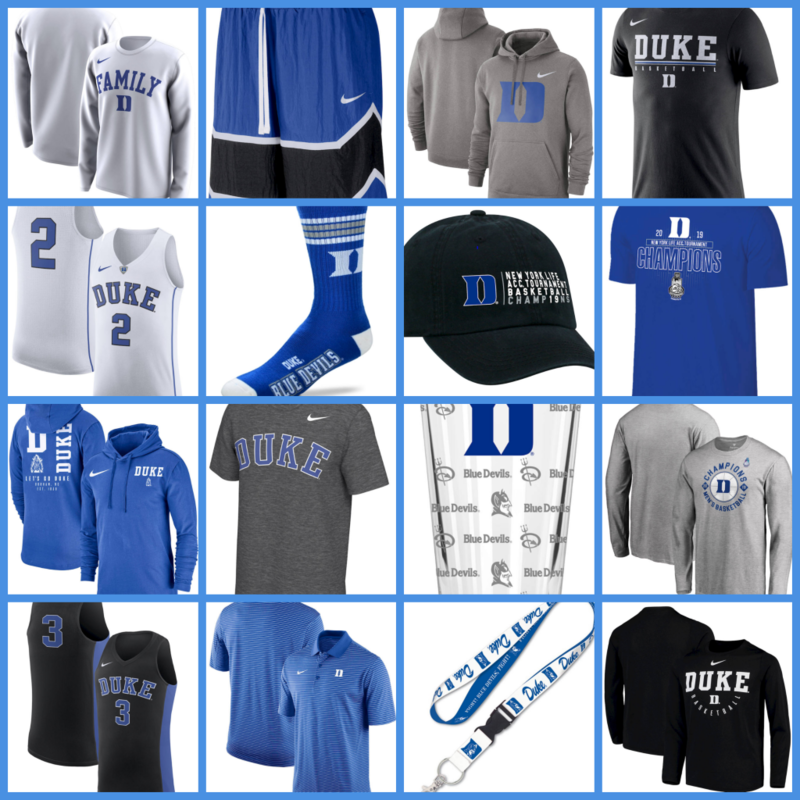 It’s a good time to grab some of the best Duke gear so you can support the team in the upcoming rounds of March Madness. We’ve curated some of our favorite Duke Blue Devil items that you can get to support them at all times. Yes, you’re a huge Duke Blue Devils fan and been supporting the team for most of your life, so much that you feel like part of the Duke Blue Devils family. You consider Zion your younger but larger cousin and Coach K is your uncle. 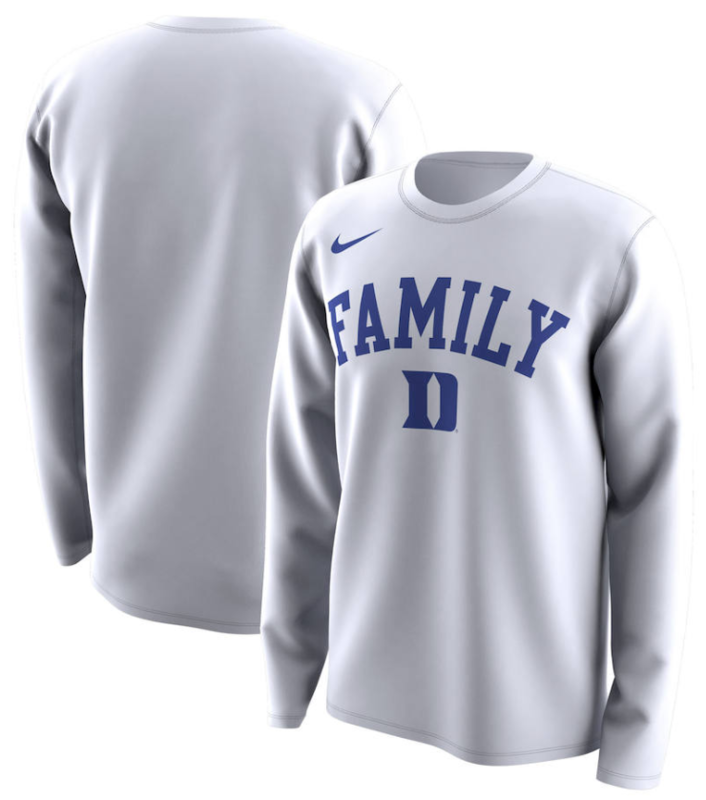 Why not share that lifelong bond with the Duke players, other Duke fans and opponents with Nike’s 2019 “Family” long sleeve performance t-shirts. You’re a Duke fan and you want to shout it out to everyone. Here’s another effective way to do announce that you’re a Duke fan and that the Blue Devils won the 2019 ACC Men’s Basketball Conference Tournament last week. Lowkey celebrate their championship with this heather grey long sleeve shirt. 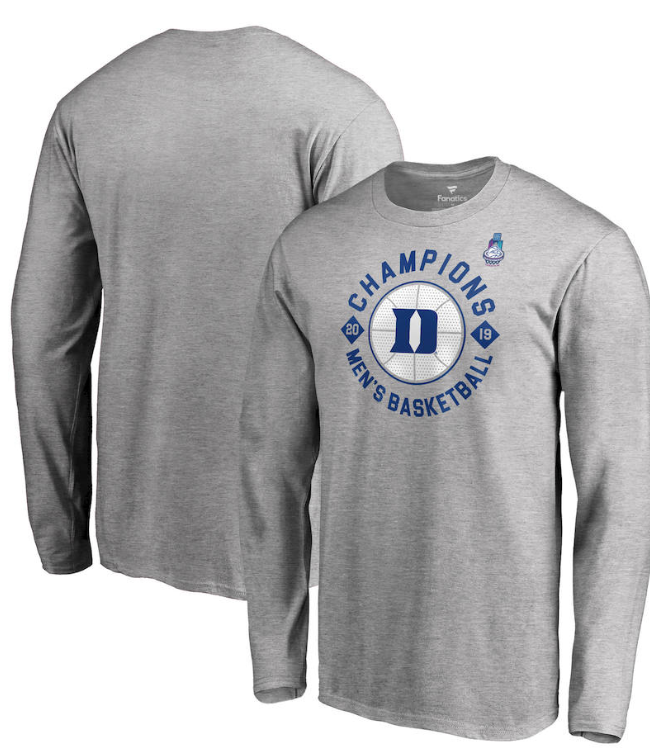 Duke is strong as the #1 seed in this year’s NCAA tournament bracket and you want to a shirt that you can wear to basketball practice or out casually with your friends. This Blue Devils basketball practice t-shirt from Nike fits both bills. Wear it untucked at basketball open plays or tuck it innto pants for a clean, minimal casual sportswear look. 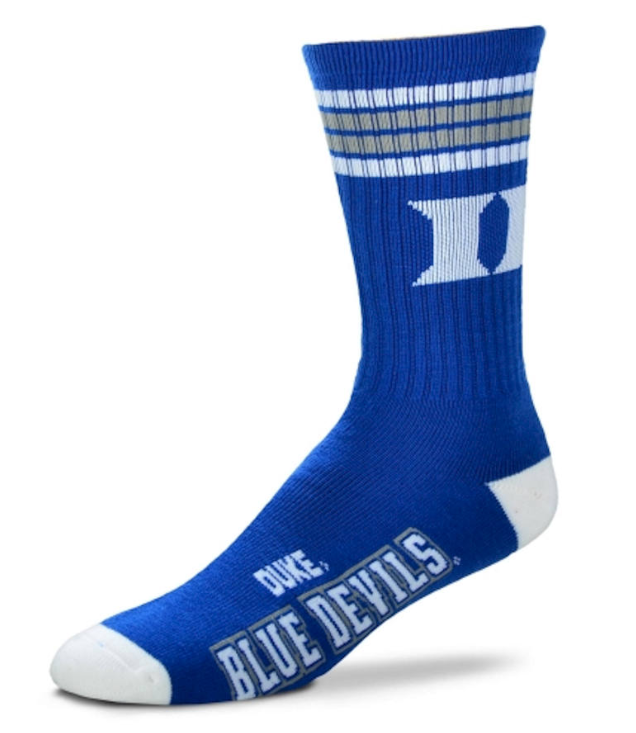 Show them a little ankle and let ’em know how serious and deep your Duke fandom runs with Duke Blue Devils socks. Honestly, these crew socks are great for whatever situation. They’re not just for the court or gym, but you can wear these out casually to show off your not so casual Duke Blue Devil obsession. 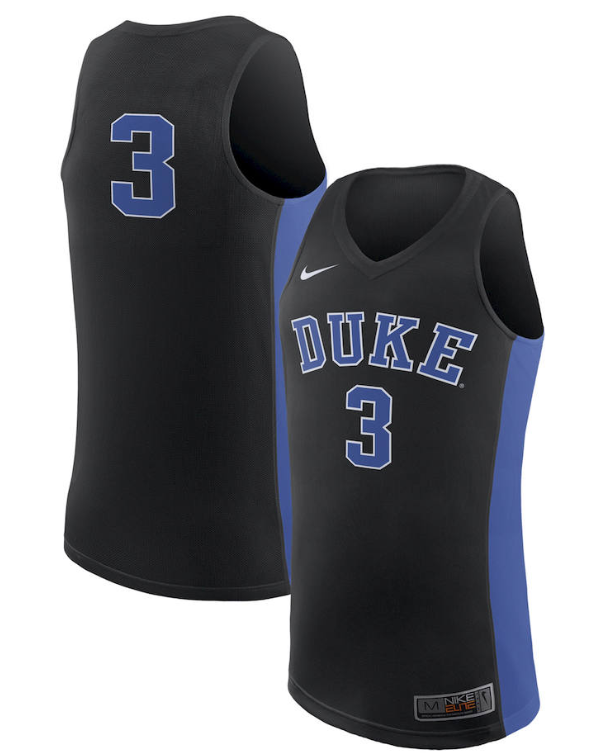 Show your support with this replica Duke basketball jersey from Nike This replica jersey in black features the strong Duke Blue Devils logo, graphics and the official Duke team colors. Your Duke pride will be unmistakable if you’ve got your Duke basketball gear on. No one will mistake you for being a fan of any other team with this authentic Duke hoops jersey officially licensed from Nike. This officially licensed Duke Blue Devils jersey might not be Zion Williamson (go here to see our favorite Zion t-shirts), but everyone knows why you’re wearing it. 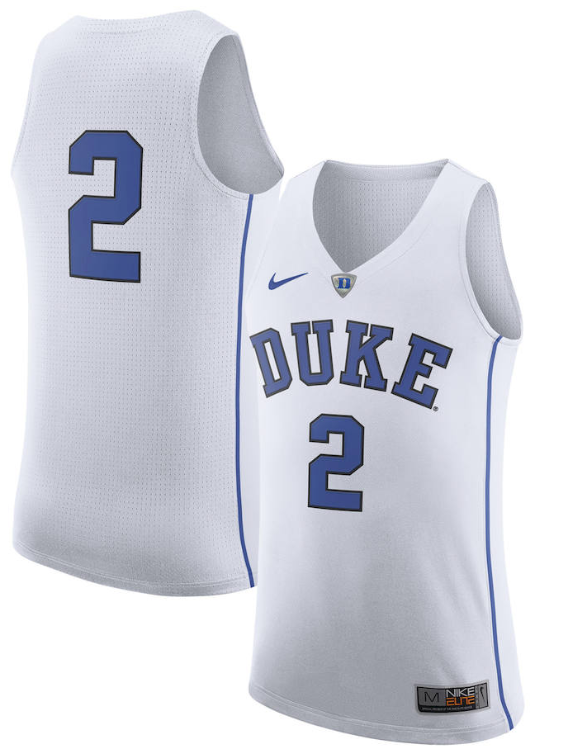 He’s apart of Duke and you’re repping him and the rest of the team with this Nike Hyper Elite Authentic Dri-FIT basketball jersey (#2) made of 100% Recycled Polyester – Body; 100% Polyester (back). Dri-FIT ® technology helps you stay cool, dry, and light. Get this authentic Nike jersey at Fanatics. 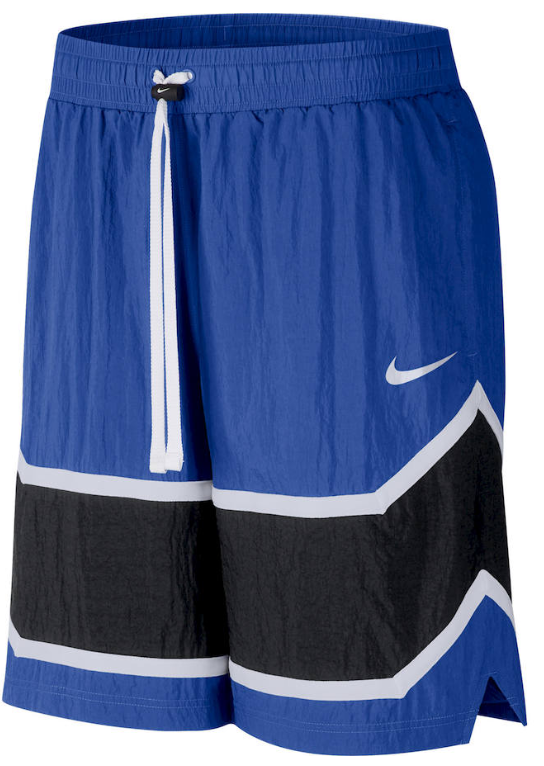 The great thing about these Duke Blue Devils throwback shorts from Nike is that they’re great for going to the gym to play some hoops, wear them out to grab a pizza, or lounge around at home watching the March Madness tournament — all the time showing your love and support for the multiple NCAA champions. Listen if basketball gear isn’t entirely your thing, you can still support Duke in small ways with Duke-branded accessories or housewares. 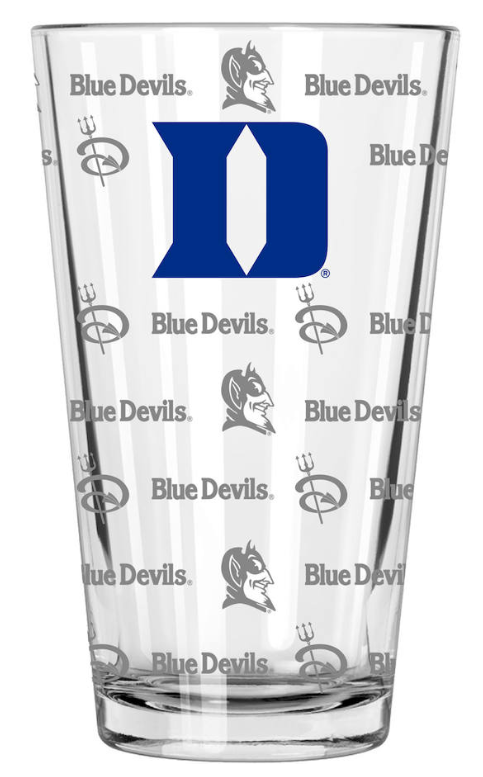 Here’s a simple mixing glass you can get at a lower price point and still display your love for your Alma Mater / favorite team. 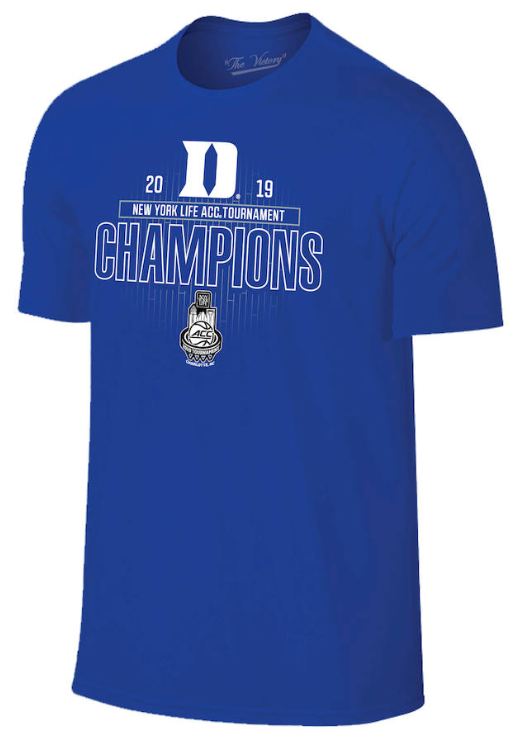 Duke won the 2019 ACC conference tournament, now show off a little for your favorite team by donning this ACC Conference Tournament Champions Locker Room T-Shirt! This blue shirt from Original Retro Brand is the shirt you saw Zion, Cam, and R.J. and the entire squad wearing in the locker room after winning the 2019 ACC tournament. It’s still a little chilly on the East Coast and in North Carolina, so stay warm with this high-quality Duke Blue Devils Logo fleece pullover hoodie from Nike. Stay hot with the Duke Blue Devils hoodie, it’s really the best basketball gear to have whenever it’s a little less than Spring weather out. Quickly put it on and head out where ever, it’s that flexible of a sports wear. Life all of Duke’s spirit with the Duke Blue Devils Vault SJY hooded tee designed by Nike. 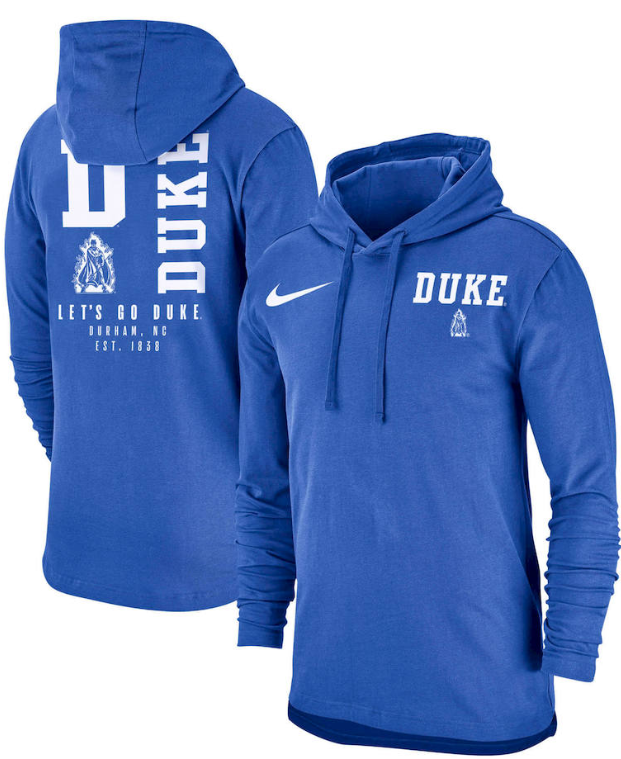 Unlike many of the items on this list, this hooded t-shirt features block graphics that features “Let’s Go Duke” emblazoned on it, so you don’t even have to chant. Just pop your hooded tee after another devastating Zion Williamson dunk. You don’t have to prove your a Duke fan, but when you feel like lowkey supporting your team with a casual flair, throw on your subtle Duke t-shirt featuring DUKE boldly emblazoned (but not annoyingly) across the front of the chest. This Wordmark Legend T-shirt is designed simply by Nike. Take a look. Classy and brilliant, man. 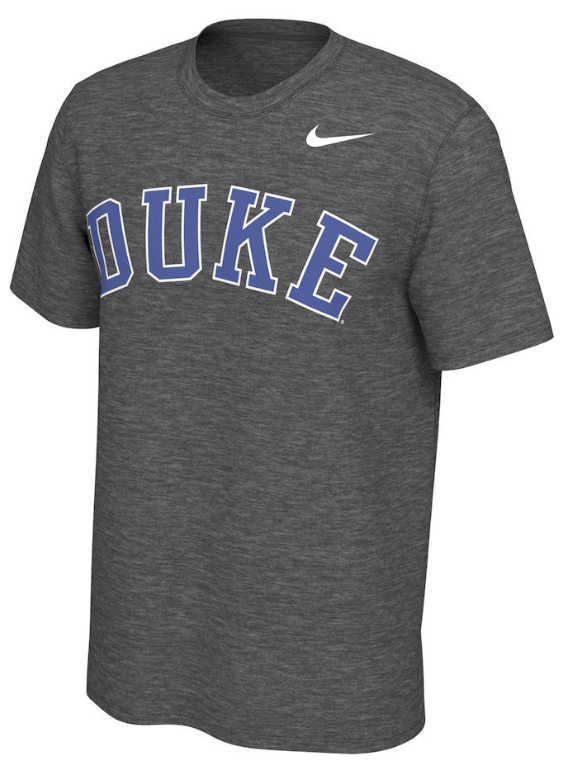 Officially licensed with screen print graphics, this Duke crew neck short sleeve t-shirt from Nike is made of 100% Polyester. This really popular Duke basketball shirt is always in stock and his item within one business day when ordered. Buy this t-shirt by visiting Fanatics. Product ID: 3435589.